No files officially released yet. See below. Firmware hacking is an impressively difficult yet rewarding task. Most people are afraid of it because it depends on reversing binaries for embedded architectures that do not have good tools. Many tools that do exist are expensive and have a high learning curve even for experts in the field. Firmware hacking is actually a fun and simple process if you know what you're looking for. Projects for cell phones, video game consoles, and calculators are often out of the league of amateurs until the initial work is done. After the system has been successfully hacked, the code (if made available as open source) can be modified by anyone to improve the software. Today I will be starting the initial steps of reversing HP M30x camera firmware. Please follow along through the Method, Data, Analysis, and Conclusion sections for detail on my process. Download HP M307 Firmware v1.1 (col9017a.exe) from HP's website. 0: .BOO loaded and programmed. F 1: .BO2 loaded and programmed. F 2: .PRO loaded and programmed. F 3: .UPG loaded and programmed. F 4: .BIN loaded and programmed. F 5: .ICO loaded and programmed. F 9: Exit and run MAIN PROGRAM. Please send .BOO with 1K-XMODEM. Please send .BO2 with 1K-XMODEM. Second Boot Loader verify OK. Please send .PRO with 1K-XMODEM. Please send .UPG with 1K-XMODEM. Please send .BIN code with 1K-XMODEM. In the above Method section I have successfully reversed enough information for a hacker to change the 'beep beep' sound of the camera and to attempt a disassembly of the firmware. The program hachoir-subfile was crucial to this process as well as general tools like rawtopgm and gnuplot. 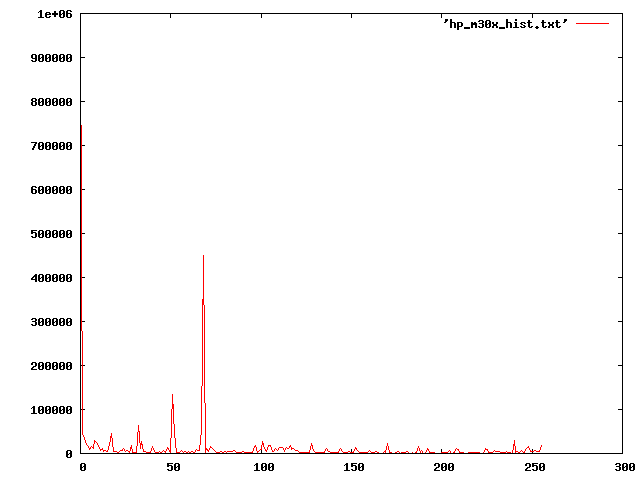 My own custom histogram script was useful but only worthwhile for formats that are difficult to decode. A few minor issues can be seen. Since hachoir-subfile must match many incredibly awful formats, it has a high false positive rate. It should be possible to modify the program to tell you the likelihood of the match. Also hachoir should automatically parse cab files using cabextract (if available) and common filesystems. This would save a bit of busywork especially for hackers who are up against CTF challenges (CTF quals I'm looking at you). It is very likely that the architecture of the HP M30x is ARM. The GNU toolchain includes an ARM disassembler and IDA Pro is capable of reversing ARM. It is quite possible that Gumstix or a similar ARM platform* could be used to test some of the functionality of the firmware. Since the firmware is self-contained, it is possible that it could run partially on an ARM system such as the uCdimm (which runs uClinux). However differences in memory layout and optimizations would probably not allow it to run for long. A full system emulator for ARM would come in handy for reversing this firmware. QEMU has ARM emulation support but I am unsure of whether it is capable of emulating a system similar to the HP M30x. * OpenWRT comes to mind because it was designed for low memory ARM platforms. I am delighted to be able to spend less than an hour starting the reversal of firmware for a camera I own and have enjoyed the use of for years. After the success of using CHDK for a friend's project, I feel that I am compelled to hack on those things for which I am able to. I hope that this has been informative into the methods and psychology of a hacker. If I end up disassembling the firmware, I'll post and update. If you beat me to disassembling the firmware, send it along and I'll give you credit. The methods here are obviously incomplete and I do not even attempt to disassemble the machine code into assembly. Most hackers would say that the start of reversing begins with getting a disassembly, but many projects are simple enough to need much less than that. Of course uploading the firmware may be as simple as a usb mass storage copy or as complex as a full protocol. There is a Windows installer, but I would prefer a Linux toolchain. It is quite unlikely that HP has signed the firmware because of limitations of the platform and the lack of interest in hacking a low quality camera in 2004. I would like to take a minute to address copyright concern. The HP firmware is copyright HP 2004. I reproduce it in Figure 1 because it is essential to the task of reversing the firmware. Also, reversing firmware is an important part of ownership of a device. The common user of a camera has a few inputs to the camera and the designers of the camera made it as simple as point and shoot, but the designers had to design it based on realistic principles of hardware and software development. Those principles include hacking, reverse engineering, and modification whether they like it or not. The reason for this is key to the spirit of hacking and the very nature of engineering. Every hacker, programmer, scientist, and engineer knows that to complete even the most trivial of creative tasks, there must be the ability to debug and to understand the concepts upon which their world is able to exist. Robust and powerful systems are necessarily complex and have emergent properties such as crashes, vulnerabilities, and "features" that often will boggle the mind of users and hackers alike. Designing a system to be resistant to hacking by adding signatures or obfuscation reduces both robustness and the ability to debug systems and eventually either causes the downfall of the product or are hacked for the betterment of the product. Examples are far and wide and I don't need to name companies because they are all well known and many of them rely on my employer's expertise to improve their software and hardware. Allow me to state plainly: I am unwilling to compromise that DRM and hardware locking is unacceptable for any copyright, patent, trademark, or regulatory restriction. The only legitimate purpose for signing and cryptography are for security measures to ensure that malicious code is not run. I applaud companies like Amazon who embrace non-DRM music because although they are apt to not get everything right they are capable of selling me music. There are certain terms that we are capable of living with and there are certain terms that we are willing to live with and the design of software and hardware requires hacking in order to change the world into one that we want to live in. If you are interested in a white hat hacking job that is fun and interesting, my employer has many opportunities currently available for hackers, reverse engineers, and especially hardware hackers. Although I plug my employer, they are not responsible for any of the content on AltSci Concepts (in fact they are not involved with any of it) and I am solely responsible for all the content herein.